We’d love your help. Let us know what’s wrong with this preview of Bluegrass Baseball by Katya Cengel. Forget the steroid-addled, overpaid, and unmotivated players: America’s pastime is still alive and well, and is still the heartfelt sport it’s always been—in the Minor Leagues. And nowhere is this truer than in Kentucky, whose rich baseball history continues to play out in the four teams profiled in this book. Following these teams through the 2010 season—the triumphs, str Forget the steroid-addled, overpaid, and unmotivated players: America’s pastime is still alive and well, and is still the heartfelt sport it’s always been—in the Minor Leagues. And nowhere is this truer than in Kentucky, whose rich baseball history continues to play out in the four teams profiled in this book. Following these teams through the 2010 season—the triumphs, struggles, and big league hopes and dreams—the book tells the larger story of baseball in America’s smaller venues, where the game in its purest form is still valued and warmly embraced. To ask other readers questions about Bluegrass Baseball, please sign up. 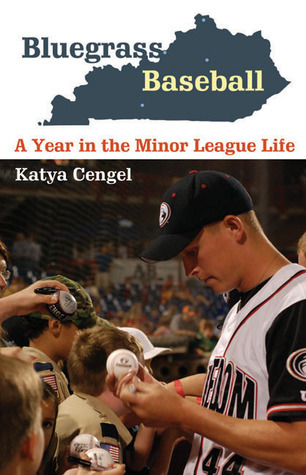 Katya Cengel does a fantastic job of bringing the Minor Leagues to life. From fair-weather fans to fanatics, Bluegrass Baseball is a great read for anybody interested in a behind-the-scenes look at the real lives of real players. In addition, she gives a face to the owners, managers, staff, families, and friends of the game. I enjoyed the ups, the downs... and the suspense. I'm happy that someone has taken the time to give a window into this unique cultural phenomenon. After moving to Kentucky, I thought it would be a good idea to learn about all of the local baseball teams in the area. This book did a great job of giving us a background on how all of these teams came to be, and the people behind the ball clubs. As a huge fan of minor league baseball, I really enjoyed the stories on the players and how they cope with day-to-day minor league life. We've now been to see of these teams, and it's just fun knowing the background, and makes the games more enjoyable. Good reflection of what it must be like to be in the minor leagues. This book at first looks like it will be just another account by or about a particular player, and the difficult and often ribald life he leads while drudging his way through the minors. In fact, it's quite different from that. First, it's written by a woman, and one who had not previously been a sportswriter. Katya Cengel, a features writer for the Louisville newspaper, was asked to take on the assignment of following some Kentucky teams and players over a season. Second, her perspective in f This book at first looks like it will be just another account by or about a particular player, and the difficult and often ribald life he leads while drudging his way through the minors. In fact, it's quite different from that. First, it's written by a woman, and one who had not previously been a sportswriter. Katya Cengel, a features writer for the Louisville newspaper, was asked to take on the assignment of following some Kentucky teams and players over a season. Second, her perspective in fulfilling this assignment turns out to be broader than just the players themselves; she looks not only at the players, but also at how the Kentucky teams developed, who owns and manages them, what makes them successful (or not), and at the families, girlfriends and wives, and fans of the players. It's a great cross-section of minor league life. Before reading this book I knew basically nothing about baseball's Minor and Independent Leagues but figured getting perspective on that world would be interesting. My hunch was right because Cengel's account of professional and semi-professionals players in Kentucky and neighboring states delivered. It's full of inspiring and heartbreaking stories of players and their families giving everything for the dream of making it to the Big Show. Katya Cengel has written about everything from retired dancing bears in Bulgaria to the world’s largest machine gun shoot in Kentucky. Her work has appeared in The Wall Street Journal, New York Times Magazine and Marie Claire among other publications. Her books include "Exiled: From the Killing Fields of Cambodia to California and Back" (Nebraska 2018) and “Bluegrass Baseball: A Year in the Minor L Katya Cengel has written about everything from retired dancing bears in Bulgaria to the world’s largest machine gun shoot in Kentucky. Her work has appeared in The Wall Street Journal, New York Times Magazine and Marie Claire among other publications. Her books include "Exiled: From the Killing Fields of Cambodia to California and Back" (Nebraska 2018) and “Bluegrass Baseball: A Year in the Minor League Life” (Nebraska 2012).